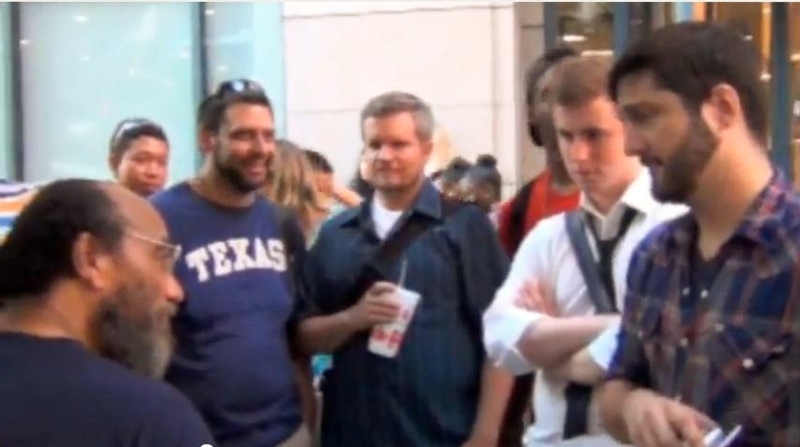 But then, she said, she saw some of the protesters gathering around a Christian man who was also sitting outside. One main complainant especially took time to speak his mind against what the man stood for. “Your Bible in itself is immoral,” he proclaimed in the video. The homeless man then commented that he believed the man hated God. The video then showed that messages in chalk were written on the sidewalk next to the homeless man, such as, “He’s gay deep down,” with an arrow pointing towards him. Following the tirade against the homeless man, Sorock approached him to ask why he believed that people wrote the sidewalk messages. Days after Sorock posted about the experience online, the main protester left a comment identifying himself as Spencer Thayer. Sorock then identified Thayer as being a well-known Chicago activist. Sorock disagrees with Thayer that the homeless man was loud or rude. Last month, Chicago mayor Rahm Immanuel told the media that Chick-fil-A is not welcome in his city because it supports Biblical marriage. However, Chick-fil-A Appreciation Day broke records across the country for its massive turnout on August 1st. Despite a few incidents of protest against the restaurant chain, such as the Arizona man who bullied a drive-thru employee while taking free water in order to “nickel and dime it” from the company, and the “Tastes Like Hate” vandalism in Torrence, California, Chick-fil-A has received overwhelming support from citizens nationwide.